Another hugely impressive turnout inside Nottingham's Dusk Till Dawn card room meant the latest WPT500 wasn't the victim of an overlay. After putting up a £1 million guarantee the organisers were beginning to sweat as the first round of Day 1s came to a close. However, a surge of entrants towards the end of last week helped push the total number of £500 buy-ins to 2,133. With the £1 million mark breached and bubble burst by the close of Day 2, it was a frantic final day at the felt on Sunday as the remaining players made a push for the £140,000 top prize. When the session began 61 players were left vying for the champion's trophy, but as the field thinned and players gradually fell by the wayside, it was PKR pro Eleanor Gudger that slowly moved into the lead. Despite starting the finale almost 9 million chips behind Matthew Noonan, Gudger was able to grind her way into contention as the likes of Derek Payne, James Parker and Hamid Rowshanaei hit the rail. In fact, by the time just two players remained it was Gudger that held a commanding chip lead. However, although the winner's trophy was within touching distance, Gudger maintained her composure and continued to employ her considered approach. While Noonan was throwing in chips with every bit of aggression he could, PKR's Gudger simply bided her time before clinching the title with Ac Qh. 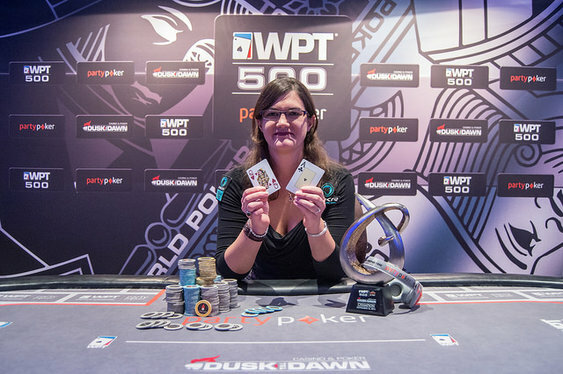 After all the chips went in, Gudger's hand was comfortably in front of Noonan's Ah 9c and as the board ran out Ks Kd Ad 5h 4c she found herself raking in the final pot of the match, her first WPT title and £140,000.